We further studied the antifouling properties of laser-induced graphene, and showed that the nanostructured surface plays an important role. Well done Swatantra P. Singh and Sanjayani Ramanan. The article is now available in ACS Applied Nano Materials. Laser-induced graphene on polysulfone membrane supports! Swatantra P. Singh, great work. Check out the recent article published in ACS Nano. Laser-induced graphene on toast anyone? Antimicrobial peptides on membrane surfaces using a photoreactive linker! Another success for Canwei Mao! Link to the article here! Surface grafting on ultrafiltration membranes via ink-jet printing-assisted modification. Nice collaboration Roy Bernstein. Great work Clare Singer! Special thanks to Swatantra Singh and Canwei Mao for their excellent contribution! Find the article freely available here! The environmental applications of laser-induced graphene are further explored. We found excellent adsorbent properties of the LIG material. Find the article with Swatantra Singh and Karthik Rathinam as equal contributing lead authors in Carbon! Laser-induced graphene is "actively" antimicrobial and "passively" antibiofouling! Find the article with Swatantra Singh as the lead author in ACS Applied Materials and Interfaces! Also, check out the article in Advanced Materials about how the properties of laser-induced graphene can be controlled! This research was also highlighted in the news. Membrane modification using patterned UV light from a 3D printer! Find the article in ACS Applied Materials and Interfaces! Good work Nathan Wardrip and Mel Dsouza! 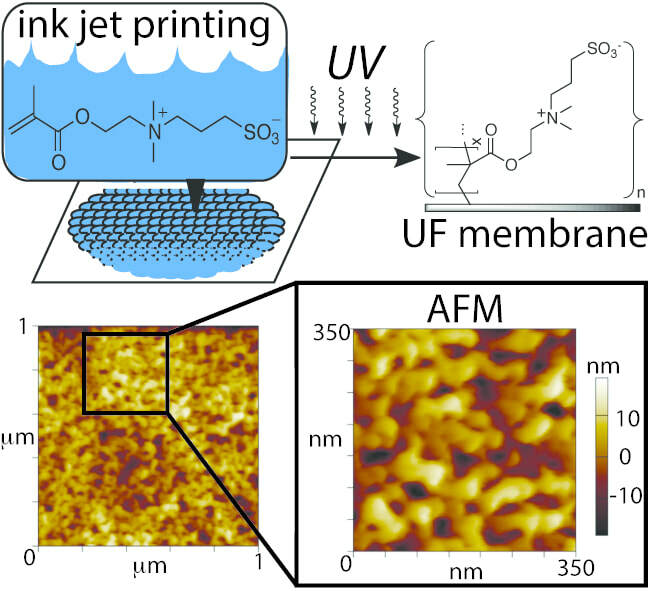 Membrane fabrication using ink-jet printing! Find the article in Journal of Membrane Science! We are interested in membrane fabrication and modification using ink-jet printing and 3D printing. Check out our recently published article in Journal of Membrane Science! We are also interested in membrane fouling. Congratulations to Robert Haas for his article in ES&T Letters! We use 3D printing to fabricate novel microfluidic flow cells for membrane testing and also for membranes! Nice Work Nathaniel Wardrip! See below!